Patent pending: My personal "Cookie Tenderizer"
Then, I spent the whole afternoon with the smooth thought of treating myself to this cookie... Guess my disappointment when I opened the wrapping tonight and discovered the cookie had turned to rock? What a shame these cookies harden so fast! Not even 24 hours after baking! Now, believe it or not, it seems that no one ever documented a cookie tenderizing process on the web! Next thing I know, I was standing in the kitchen with a grin on my face, starting some weird experiment... and, against all odds, it only took me about 15 minutes to revive my cookie! 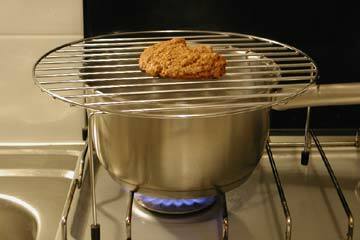 It's a simple machine actually: stove / pan (with water) / steam / grid (originally for pizza) / dead cookie. Just let the steam go through the cookie for a few minutes... and enjoy! Your cookie is now tender, chewy and hot, just as if it came right out of the oven. Warning: it can get *really* hot! Some of the most important nutrients are highly perishable fatty acids that occur in extremely small amounts, yet have vast repercussions in one's body. Commercial food preparers are unlikely to find it convenient to use fats that contain these highly perishable fatty acids in their products, so they will substitute fats with a longer "shelf life." If I have eaten nothing and then eat a good orange, I get a sensation of sweetness. If I eat candies, and then eat the same orange, I get a sensation of sourness. My senses are relative, but my sensations are absolute. By omitting the candy, I would have experienced no sourness. In common language, candies cause sweetness. In reality, candies cause sourness. Nutrition takes time. It takes time for every animal to get its food, prepare it, eat it, and clean up. We suffer from food inflation, in which food is plentiful, quick and easy to get, but unfortunately some necessary nutrients are in short supply.